For most of the movie going public the starting point for what is Marvel’s Cinematic Universe is Iron Man, which premiered in theatres in May of 2008. But the truth is that the origins of the MCU go back over a decade prior, and in true comic book fashion begin with something potentially devastating. Thanks to the impending burst of the comic collecting bubble, and the increasingly bad business decisions of then-owner Ron Perelman (NOT the Hellboy guy), by the mid-90s the Marvel Entertainment Group was in financial ruin. Bankruptcy was filed, a power struggle ensued, and eventually the people that set in motion (including Perelman) were out. Enter Isaac Perlmutter and Avi Arad. While Perlmutter is not familiar to movie audiences at all, Arad should be. At least his name should be. It was pretty prominent on some very successful superhero films like Blade, Spider-Man, and X-Men (and eventually the Fantastic Four). And as hard as it might be to believe it now, it was a struggle to get any of them made. This is probably why the first “Marvel” film featured Blade (no, Howard the Duck doesn’t count), and not one of its higher profile characters. Horror films are an easier sell to studios and audiences. While those three franchises were extremely successful, Marvel as a company saw very little of that financial component. Sure, it’s fun to see your babies up on the big screen, but pretty heartbreaking to know that you’ve got almost zero creative control when it comes to the story telling decision, and your kids will never get to play in the same park, thanks to selling the right to pull themselves out of financial ruin. Add to that the relative pennies they were getting for laying all the ground work, and it’s clear to see why less than a decade after Blade, the company wanted to make their own films. In 2005 Marvel leveraged most of its remaining characters to Merrill Lynch to raise financing for its first film, Iron Man. It’s a gamble that would pay off in ways they never thought possible. Like a lot of Marvel characters, Iron Man had been in development as a film for quite awhile, bouncing from studio to studio, with a multitude of stars rumoured to play billionaire Tony Stark. Nic Cage and Tom Cruise were probably the biggest names, but neither of them got the call to wear the helmet when Marvel went into production. Equally impressive is the list of directors and writers attached to previous iterations. Joss Whedon, Nick Cassavetes, David Hayter, Alfred Gough and Miles Millar were all attached to previous productions. Marvel decided to go with Jon Favreau, a guy with two films under his belt; Elf and Zathura. From the outside looking in, it didn’t make sense. Thankfully hindsight is 20/20. Those two films showed that Favreau could bring the heart and humour, and deal handily with an effects laden production. 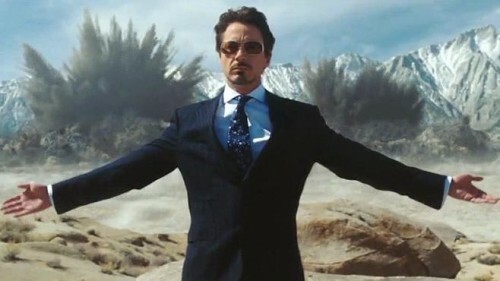 It was also Favreau who fought to cast the man that is now the cornerstone of the MCU, Robert Downey, Jr. Not the first choice, or even the second for Marvel execs, but Favreau argued that RDJ had lived his best and worst moments in the public eye, and that’s exactly who Tony Stark was. Again, hindsight. The rest of of the cast was in place, but when production began the script was unfinished. This left Downey the ability to craft a Tony Stark almost all his own. With encouragement from Favreau he ad-libbed a lot of his dialogue, chewed all of the scenery he could get his teeth into, and then would ask for multiple takes to try it all over again. A distribution deal with Paramount was put in place, and eventually the public started getting their first glimpses of what this new superhero film was going to be. And regardless of what people will say now, it was not all positive. The costume looked clunky and ridiculous in the leaked photos, one of which can be seen at the end of the first movie. Doubt set in for a lot of people, and I’ll admit to having my fair share. Sony and Fox had started out strong and squandered what made the Spider-Man and X-Men franchises work, and it looked like Marvel might be coming out of the gate with something equally disappointing. I think it’s probably fair to say that the first trailer silenced a lot of the critics in geekdom, and more importantly introduced the character to an unsuspecting public. Though he was one of the earliest Marvel characters, Iron Man was no draw for the movie going public. Spidey and the mutants had had successful, long-running cartoons which gave them a bit of mass appeal. Iron Man had failed crummy one and at that point had been reinvented so many times in the comics themselves he was kind of a joke. Opening day I stood in line to get tickets with my brother. In front of use were two people talking about going to see the movie. They mentioned not knowing anything about the character at all, or even what the movie was about. But they dug the trailer. For Iron Man, the rest is history. It did big bucks, RDJ was an immediate superstar again, and after that post-credits appearance of Nick Fury all anyone could talk about was what was next. But, while Captain America and Thor were being discussed, and Iron Man 2 got the green light, it was actually Incredible Hulk that came next. Only a few months later in fact. The plan was simple; reintroduce the Jade Giant into the newly created MCU, all while giving him his own story and mostly stepping over Ang Lee’s flawed masterpiece (my opinion) Hulk. By those measures, the movie was a success. In an ironic bit of trivia, director Louis Leterrier actually wanted Mark Ruffalo for the film. Marvel and Universal (by most accounts) wanted Edward Norton. This time the studios won out. Norton would go on to rewrite the script on a daily basis, not an unusual tactic for the actor, which could explain the films fairly excellent start and its slow crawl to a video game ending. Unlike Iron Man, audiences didn’t really show. Whether it was because they still felt burned by Ang Lee’s film, or they just didn’t care, the movie just did okay. A lot of people still believe this is why we haven’t gotten a third solo Hulk film, but that probably has more to do with the weird distribution rights. Marvel can use the character, but Universal still has the rights to any solo film effort, even after the Disney buyout. That aside, the film is set in the MCU cannon, and you can even see references to it in Iron Man 2. The film also contains one of the more confusing tags in the MCU, a scene between Tony Stark and General Ross discussing “putting a team together.” It’s something that would have to be walked back and retooled once the studio finally had a (somewhat) complete blueprint. And that wouldn’t happen until Iron Man 2. Two years later!